Mark from Dogs With Cones wrote in yesterday to alert me to some really important small dog news. 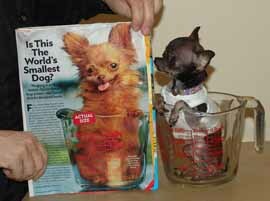 The Guinness Book of World’s Records has named Ducky, a little Chihuahua, the world’s smallest dog! Weighing in at 1.4 lbs and measuring 4.9 inches tall, Lisa Messier, Ducky’s owner says she paid $5,000 for him (according to USA Today, “based on his current weight, that’s $223.21 an ounce or $1,020.41 an inch.”) “Now, under Messier’s tutelage, he’s taken to wearing a tiny suede jacket with crystals.” More photos please. You should take time to read Lisa’s letter to USA Today, which is a fascinating look into the life and times of Ducky. This isn’t exactly small dog news, but I feel it is noteworthy nonetheless. 3 baby tigers were rejected by their mother and took a particular liking to a dog that had recently given birth to her own litter of puppies. That photo shows the mother nursing the three tigers and her own pup. Awww. Entry filed under: chihuahua, dog, dogs, JUNE 2007, Pretty In Pink, pup, puppy, small dog, small dogs, World's Smallest Dog. You think i stand so firm, you think i sit so high on my trusty steed? Let me tell you, I’m usually face down on the ground, when there’s a small dog stampede	But there is suffering in life, and there are defeats. No small dog can avoid them. But it’s better to lose some of the battles in the struggles for your dreams than to be defeated without ever knowing what you’re fighting for. What kind of glass was used for that ‘small’ dog? If it’s a shot glass then probably it’s the smallest dog. I wonder what’s in that nursing.jpg photo. I didn’t know Coke has a new non-human model. That’s so cute! I believe it’s a sewing thimble, that looks about right. 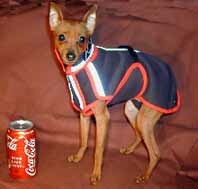 Coke decided to ditch the polar bears, in favor of small dogs. no its not a shot glass…its a 2 cup pyrex…a shot glass? Omg its a dog not a bug!